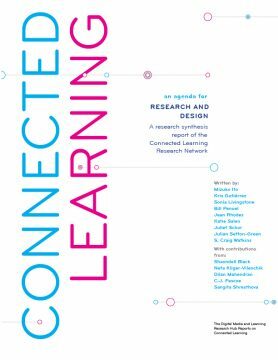 This report is a synthesis of ongoing research, design, and implementation of an approach to education called “connected learning.” It advocates for broadened access to learning that is socially embedded, interest-driven, and oriented toward educational, economic, or political opportunity. Connected learning is realized when a young person is able to pursue a personal interest or passion with the support of friends and caring adults, and is in turn able to link this learning and interest to academic achievement, career success or civic engagement. This model is based on evidence that the most resilient, adaptive, and effective learning involves individual interest as well as social support to overcome adversity and provide recognition. The report investigates how we can use new media to foster the growth and sustenance of environments that support connected learning in a broad-based and equitable way. This report also offers a design and reform agenda, grounded in a rich understanding of child development and learning, to promote and test connected learning theories. Today’s educational institutions are struggling to fulfill their mission of providing pathways to opportunity for all youth. In the past two decades, earnings have dropped for those without high school degrees, while dropout rates have continued to remain high among vulnerable populations. At the same time, privileged families are turning to costly private schools and enrichment activities for an educational edge, preparing their children for a competitive and volatile market for professional and fulfilling jobs. Connected learning recognizes a tension between current approaches to education and the world that youth will inherit. Traditional pathways through schooling toward stable careers are an option for fewer young people; in their current form, schools can only deliver opportunity to a shrinking proportion of youth. Without educational alternatives that expand and diversify meaningful life options and pathways available to young people, we risk reinforcing an educational system that only serves the interests of elites, breeding a culture of competition for scarce opportunities. In a world of global interconnection and rapid change, effective learning is lifelong and integrated into the real world of work, civic engagement, and social participation. We can’t expect young people to be able to “bank” knowledge and skills from school and apply them to a stable world of work later in life. Instead, we need an approach to educational reform that recognizes learning as an ongoing process, connected to a diverse and evolving ecosystem of learning resources, institutions, communities, and outcomes (Freire, 1970). Like Clarissa, Snafu-Dave looked online to find learning resources and relationships that supported his passionate interest in web comics. His college years gave him the time and space to explore his interest and hone his craft, though he found few courses directly relevant to his professional development. By accessing online tutorials, connecting with expert peers, and publishing online, Dave eventually became a commercially successful web artist (see Case Study 2). Both Clarissa and Dave are unusually resourceful young people who forged learning pathways to opportunity largely through their own initiative. Privileged families also support tailored learning opportunities through clubs, camps, sports, and other programs where their children get recognition, gain skills, and make meaningful contributions. The reality for too many youth, however, is that they see a shrinking set of options and little guidance towards new kinds of learning opportunity, community contribution, and diverse careers. Take the example of Louis, a young man highly involved in media production through a local hip-hop youth program. An accomplished and articulate artist, he nonetheless has a tenuous relationship to school. He describes how he feels his teachers “set you up for failure” and he has watched the majority of his friends drop out from high school. While Louis was able to pursue a passionate interest with peers and mentors in his community program, he was not able to translate and connect his accomplishments to recognition in school or career (see Case Study 3). What would it mean to consider an educational agenda that includes more flexible, informal, diverse, and interest-driven learning environments? Can we do this in a way that elevates all youth rather than serving the privileged minority? How can we capitalize on today’s new media to expand these forms of learning opportunity? Can we support literacy in common core standards, as well as new media literacies, production, and design? Addressing these questions begins with a sober assessment of education’s role in today’s economic, social, and technological landscape.